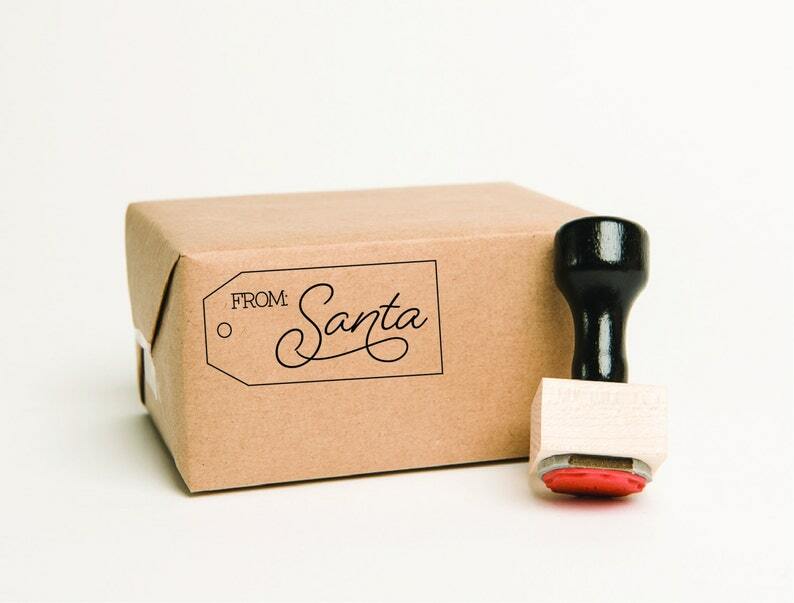 'from santa' stamp for your christmas gifts and gift tag stamping! • all sizes are in inches. • all sizes are approximate. actual size may vary slightly. • engraved rubber is mounted on a beech wood block. • stamp design is also engraved onto the wood block. • black handle is not included. • black handle is included. • Orders are handmade and shipped from our studio in Ireland. • Super low cost shipping prices. • Just 4-5 day delivery to USA. • Shipping upgrade options available - please inquire. L O V E . T H I S ? . . . W A N T . M O R E ? These turned out to be adorable! Awesome! I love them, perfect like in the pictures. The products arrived in time, I had no problems with them! We are in the studio, working on orders and answering all your questions and queries on weekdays between 9am and 5pm. (Our time zone is EST +5hrs). All emails and order enquiries will be answered by either Amy or myself (Diane). We really try to respond to all emails within 24hrs.. however this often stretches to 48hrs if we are busy. We are a small and very busy team! If you email us, please bare with us... we absolutely will be back in touch with you as soon as possible. Our weekends are very important to us. We will return all messages received over the weekend early the following week. Please leave your personalization details in the ‘Notes to Seller’ box at checkout. Please send your artwork to us by convo and select the ’Attach Image’ wording on the bottom right of the text box. Alternatively you can send the artwork by email to hello@thestamppress.com. The preferred file types are; JPEG or PNG but we also accept PDF, AI, PSD and EPS. Please ensure that the file is clear, crisp, high resolution and legible. The larger the file the better... we can edit the size to suit the stamp size. CAN I EDIT FONT / WORDING ON A STAMP? Absolutely! 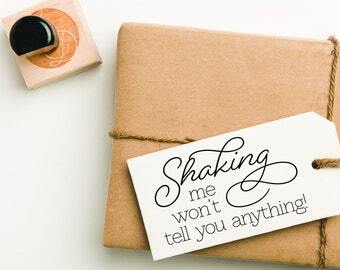 All of our stamps are completely customizable. 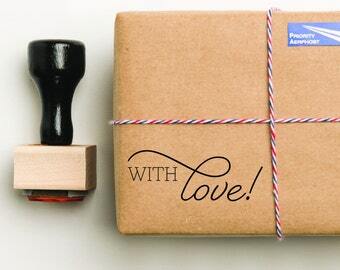 Please send us a message and we would be happy to customize the stamp for you! We don’t automatically provide proofs, but would be more than happy to issue one if requested. Please note that issuing proofs may delay the production time. If requested, proofs for personalized stamp orders will be issued within 48hrs. Proofs for new custom stamp designs will be issued within 1-2 business weeks. WHICH STAMP TYPE SHOULD I CHOOSE? WOOD | CLEAR | SELF-INKING? These are great for crafting & DIY projects because of their versatility. They require a separate ink pad and so can be used with many different colors and ink types. They are also great for use with embossing powders. These are the fast and precise option. The black ink is built into the stamp. They also make that great "ka-dunk" sound! The ink lasts for approx 10,000 impressions & they can be re-filled when they run out. All sizes are listed in the listing descriptions as well as the dropdowns in each listing. If you are unsure what stamp size you need, we find it can be super helpful to take your tag / card / scrap of paper etc and then roughly draw out the size stamp you would like to a achieve. Then just take a ruler and measure your doodle! Helpful tip : If you are planning to stamp on tags... make sure to factor in the location of the hole for the string when calculating the 'stamp-able area'. If you have any queries AT ALL... please shoot us and email and we will get back to you asap! UH-OH! I USED THE WRONG SHIPPING ADDRESS! WHAT SHOULD I DO? Please let us know ASAP! (Within 24hrs if possible). We will update the shipping information on our end but please note that we cannot change the address on your actual Etsy Receipt. 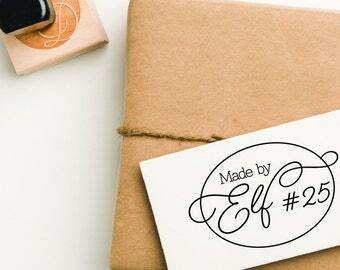 When we mark the order as ‘Shipped’, the original address will still appear on your Etsy receipt. We will provide you with tracking information for the new address. If you do not let us know the address is incorrect, we are not responsible if the order is shipped to the wrong address. We will ship to the address on the Etsy receipt, unless otherwise notified. If the package is returned to us due to an incorrect supplied address, the full shipping rate must be paid again in order to re-send it. We will provide an invoice via Paypal. All our stamps and seals already come with the prettiest of packaging! - Our stamps come packaged in a kraft bag with a pretty sticker. - Our wax stamps & embossers come packaged in a cute cotton bag. However we do also offer gift wrapping - just select this option at checkout. Gifts are wrapped in kraft paper and tied in a luxury black & white striped ribbon. 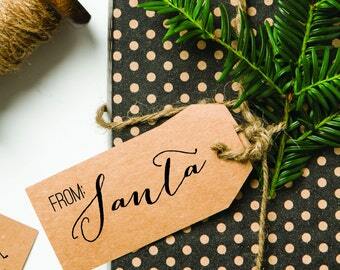 A little white gift card is also included for gift messages.